Accidents are nature’s way of checking if you are prepared! It’s almost a guarantee; no matter how overprotective you are of your precious Smok TFV12 Baby Prince - knocks, bumps, and bruises are nearly inevitable. Often your tank comes through unscathed, but when it doesn’t, the result is nearly always a catastrophe! Prepare for the worst by ordering a high-quality glass replacement for your favorite tank system! 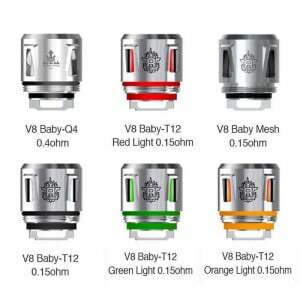 This replacement glass section has been crafted from the identical materials, to the identical QA standards, and by the identical manufacturer as the original included with your performance-focused TFV12 Baby Prince. This Replacement Glass offers perfect fit and finish for your Baby Prince tank. Hope for the best - while preparing for the worst by getting a few of these awesome Smok TFV12 Baby Prince Replacement Glass sections into your VaporFi shopping cart today!